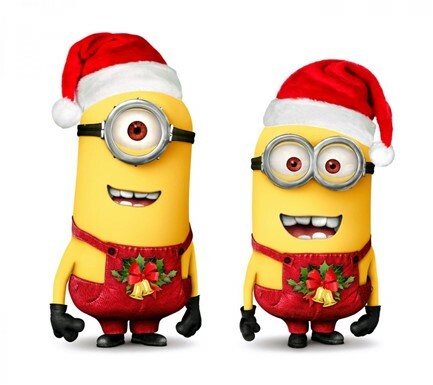 In the true spirit of christmas, I will share some cool tricks on how to get deeper into Power BI. 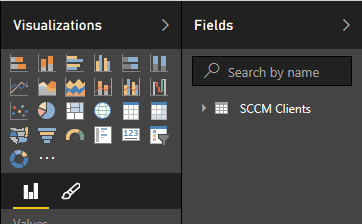 My good friend and collegue Henrik Hoe started out by showing a little bit on how to get started with Power BI, I will extend upon that and show you how easily create a live view of SCCM inventory data. In order to connect to the data, we need to either connect to the database and select what views and tables we like to include, or we can make a query that gets the data we need. 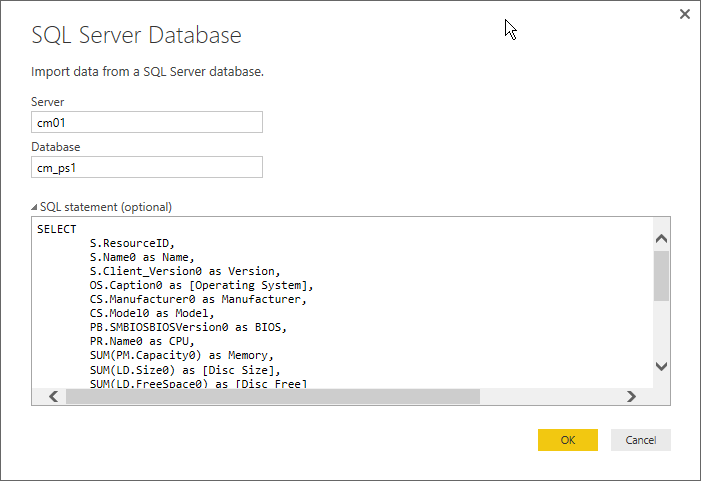 For this example, I decided to build a SQL query in order to keep things relatively simple. 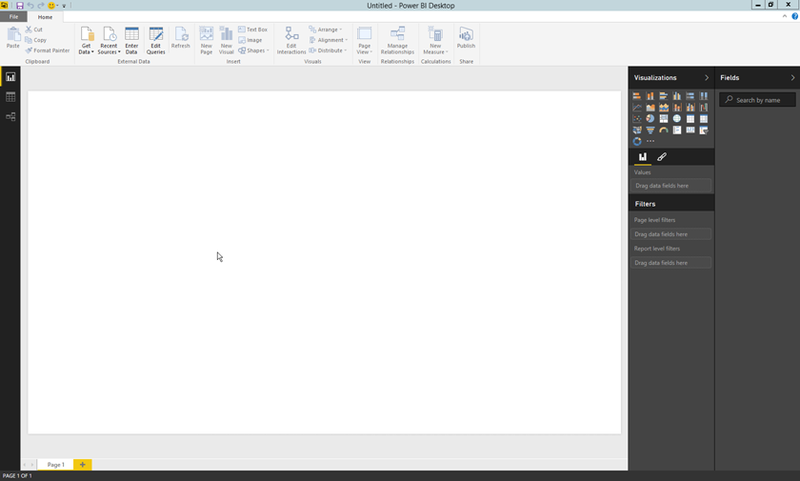 As you can see I pasted in my SQL Query in the lower text area. 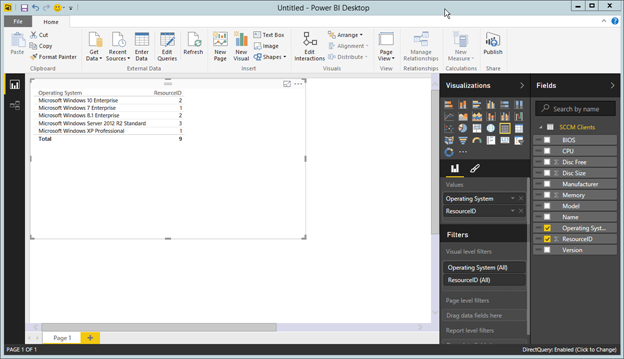 Click OK to see a preview of your data. 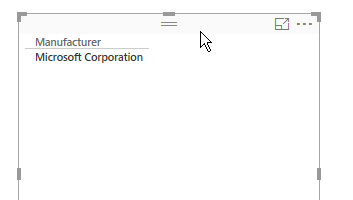 Now click Load and select what type of connection you want, in this case we go with a DirectQuery. Click OK one last time, and wait for Power BI to setup the connection. 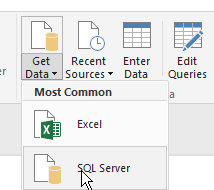 Depending on how you connect to your data, you may need to do some clean-up or adjustments to your data before using it, table and column names can sometimes be strange and not so readable, but you can rename, reorder and change a lot of these to make things look better. 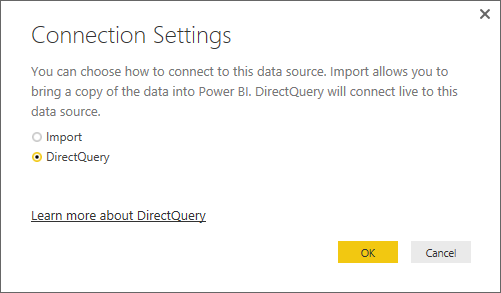 The query that I have used, is pretty much ready to go with column names and such, but one thing I like to do is to rename the Query, as Power BI just calls it Query1. Now expand the Query to reveal the data that we can play with. 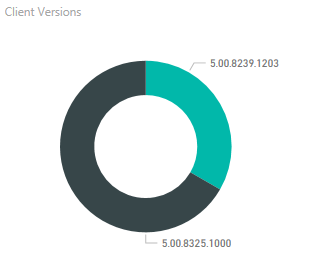 This gives us a rather boring table view of the different Operating Systems we have registered for clients in SCCM, but let’s beef it up a notch. Drag the ResourceID row to the table and see how Power BI adds a count column to the table, which still quite boring. 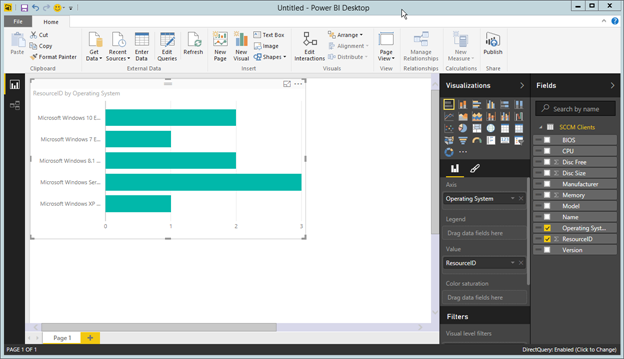 Now for the fun part, with the table selected, click the Stacked Bar Chart icon and see what happens. 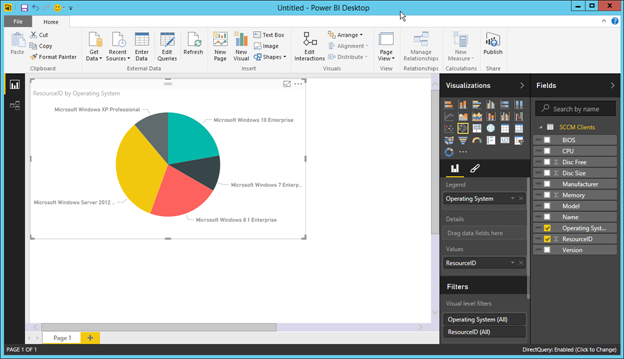 Try some of the different chart forms to see what suits you and your data the best. 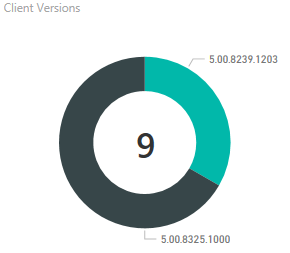 Resize it and drag it over the Donut chart we made earlier to create and nice total count. (I removed the category label in my sample). 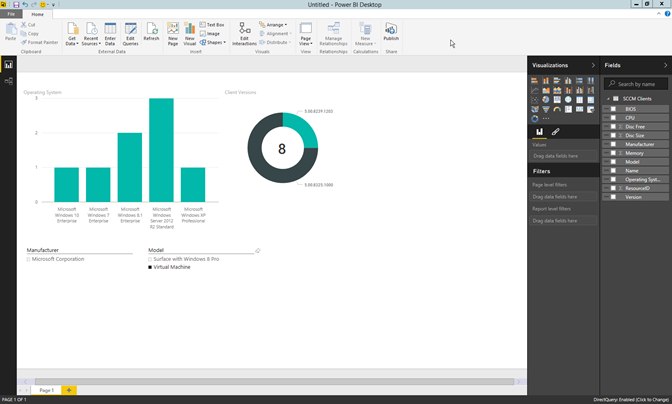 Some people will maybe say that all of this could be done in Excel, and yes it can, but Power BI has a very cool feature, that I have not yet seen in Excel (I’m no expert on Excel at all). 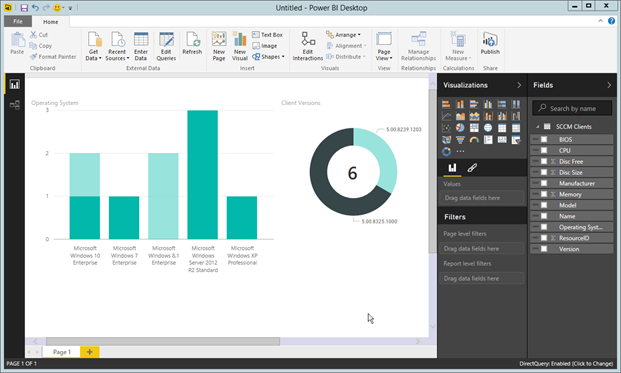 Slicers is where Power BI really takes off when you look over your data. Lets add a slicer to our chart. 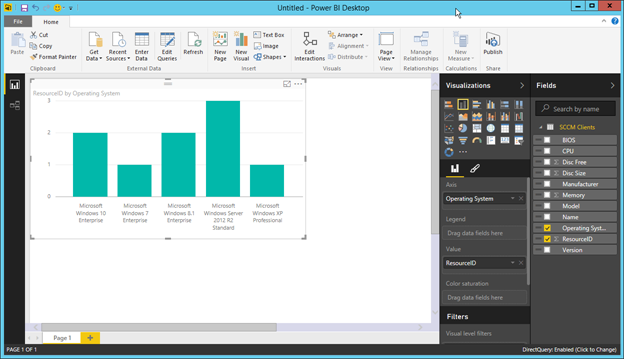 Drag out the Manufacturer row into the Power BI surface and drop it in a free area. Now the table has a checkbox. Let’s add another one, drag the Model row to a free area, and again change the table into a slicer. 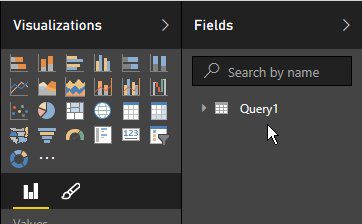 Power BI has already connected the two slicers with all the other Visualizations on the page, so when you check or uncheck the boxes, it filters the data all over the page. 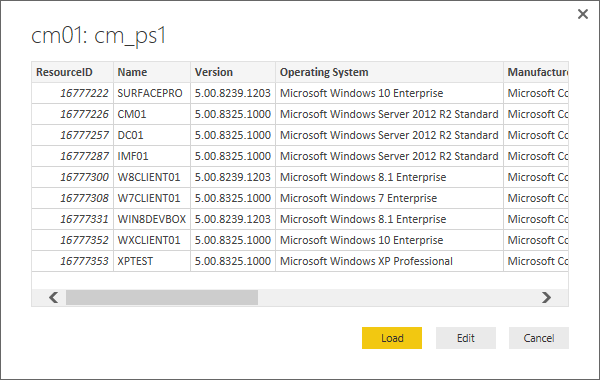 I added another slicer to filter on Operating Systems also. 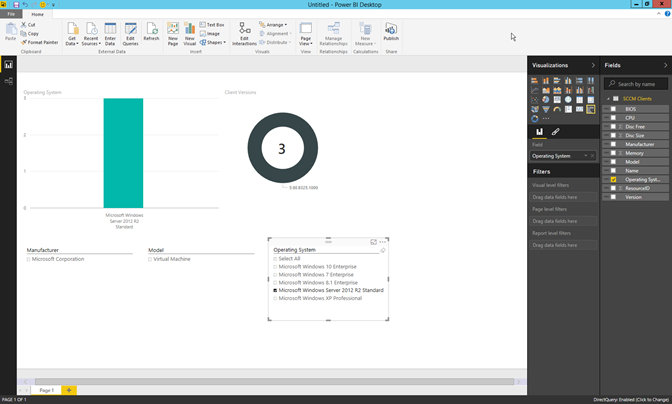 Well that’s it for this little dive into Power BI, hope you enjoyed it. What’ѕ up, I read ykur bloys likee every weeҝ. Yourr story-telling style is witty, kee up the good work!